Christian Jessica Deanda, left, Eraca Dawn Craig, right. 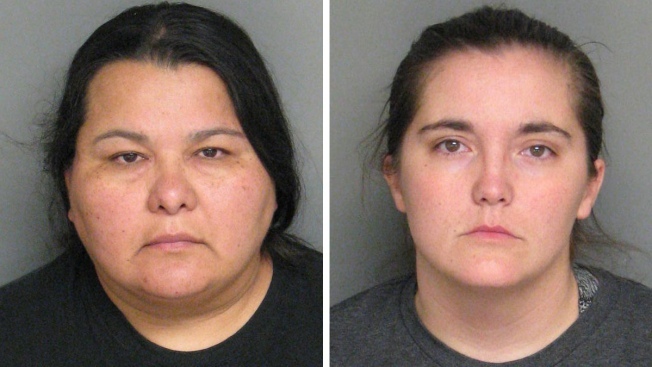 Deputies responding to a Salinas, Calif., home on March 14 to investigate child neglect allegations found three starved and abused children, one chained to the floor. The deputies found three children - two boys, ages 3 and 5, and an 8-year-old girl - who they said exhibited signs of physical and emotional abuse. The suspects, Eraca Dawn Craig, 31, and Christian Jessica Deanda, 44, were arrested for numerous child abuse-related cases. They have pleaded not guilty to the charges against them. The children were found in a starved condition, deputies said. The girl had been chained to the floor to keep her from obtaining food. "The little girl was from time-to-time chained to the walls of the house and denied food," Monterey County Sheriff Scott Miller said. "She was extremely emaciated. She's been described as someone who looks like she's been living in a concentration camp." One of the children was hospitalized and the other two were taken i nto protective custody by CPS, the sheriff’s office said. One of the two women arrested is the biological mother of the 3-year-old boy. The girl and the 5-year-old boy were adopted. The Monterey Herald reported that Craig is a former corrections officer, while Deanda was a businesswoman and counselor in California and New Mexico, according to court filings and LinkedIn profiles. The Herald also reported that the women are domestic partners and that there were indications that they were preparing to leave the area soon. Deanda and Craig are scheduled for a preliminary hearing on March 28.